Under the gas station lights, wind tossing my hair. I think I held up well. Saturday turned out to be about the best day ever so far in my transition, and I have my ex to thank for it. One thing my ex and I always shared was a love of Christmas. We both really get into the season — decorations, cookies, gift giving, Christmas music, the works. One of our annual rituals has been going out to the Hallmark Cards Christmas kick-off weekend. Robin is a member of their shoppers club, and she always gets a special invite to the kick-off — early hours, some giveaways, and a free gift bag with $50 purchase. Even in our rougher years, we would go out together each November and just have fun. I didn’t anticipate going this year. I figured that her boyfriend would take my place and I would be out one cherished Christmas tradition. After all, it was something she did with her man, and I was no longer her man. Imagine mg surprise, then, when she asked if I was going wither this year. “I thought you’d take Chris,” I said to her when she brought it up. i was was expecting some sort of pushback. I didn’t want to ruin the day by making it weird or by getting us kicked out of the store. But she insisted that it wouldn’t be an issue. I was glad she didn’t have a problem with it, because going out as Him is something that I’m enjoying less and less as time goes on. If I’m going out, I want to be me. This would be different, though. Outside of my group sessions, I have never actually been with other people when I’m in Ali mode. I’m a solitary person living a solitary life. I’m out to so few people that the opportunity for a social outing just never presents itself. This outing would have one more little complication. 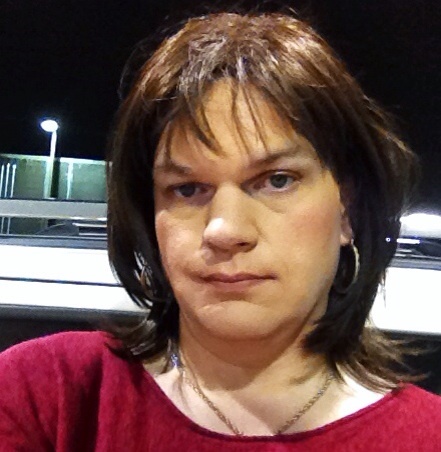 Though my ex is one of the few people who has seen me as Ali, she only saw me a few times early in my transition And she’s never seen me in my wig. There was still a chance that she could see me and laugh, or see me and get cold feet, or see me and just decide that she couldn’t be seen with me in public. This outing could be over before it even started. Still, fortune favors the bold. So on Saturday I got done up, picked up my ex, and went to the Hallmark store. When she got in the car she didn’t even blink. It was like I had always dressed like that. She did say after a few minutes that she was a little surprised that I looked as good as I did, but I think she was just being kind. Otherwise, it was as thought there was nothing different between us. It was in a crowded mall — a thousand potential eyes on me, a thousand chances for someone to stare or laugh or insult — but being with someone else made me more comfortable. We went to the store, wandered around the displays, picked out some boxed Christmas cards, and generally fell into our annual routine. Despite the store being crowded with middle -aged women, I barely noticed any looks or stares. The store staff treated me like anyone else (though with the obvious elimination of any gender labels). It was normal, and routine, and typical, and not at all made weird or awful by the fact that I was in Ali mode. It was, in short, wonderful. Afterwards we stopped at a Starbucks for coffee and ended up staying there for nearly two hours talking. We talked like friends — she even shared intimate details about her relationship with her boyfriend (ew) — and I started to relax to a level I rarely get to when I’m out. I felt normal. I felt HUMAN. it was sad when things had to end. I didn’t really want to go home, to change, to let this feeling fade. But life called. As I dropped her off , I thanked my ex for inviting me and for treating me like who I was, not who I used to be. There’s an authenticity in me now that wasn’t there before Saturday. I feel a little more confident, a little more real. I can’t wait to go out for coffee again. Hi, I have a wonderful friend whom I love dearly and has made the decision to transition from biological female to biological male. He intends to proceed with the appropriate medical procedures in due time and my main concern is he is severely overweight. My main question is this, is transitioning more dangerous for people who may be considered obese? I have heard and read mixed views and was wondering if there were a consensus.